7 or 9 nights - 6 or 8 days independent walking moving between guest houses. 7 or 9 nights' accommodation in several charming hotels (mainly 3 star) and guest houses in double or twin rooms with own bathrooms. A variety of styles with good hospitality and comfortable accommodation throughout. 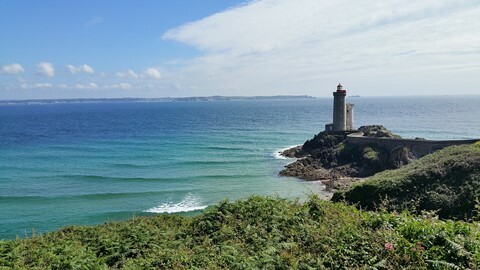 Your self-guided walking holiday takes you along the northern Finistere coast in Brittany heading west from Aber Wrac'h and going around the cliffs at the most westerly point in France before heading to towards Brest. 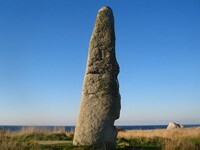 This independent holiday is the second part of a two part walk between Roscoff and Brest. You'll either undertake a 7 night walking holiday which ends in Conquet or a 9 night walking holiday which ends in Brest. The coast of Legends in Brittany has a thousand different faces, including dramatic cliffs, beautiful beaches, sand dunes and stretches of pebbles. The long estuaries or Abers create wide breaks in the coast. 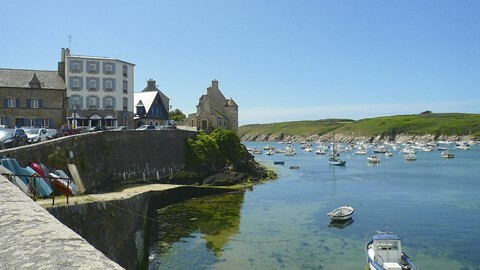 Starting with Aber Wrac'h, you'll go around two further estuaries as you head towards the western-most tip of Brittany. This section of coast is varied, each day changing in character. There are sections of large bays and dunes, smaller secluded bays, protected by wild headlands, rocky peninsulas and heather-covered cliffs. 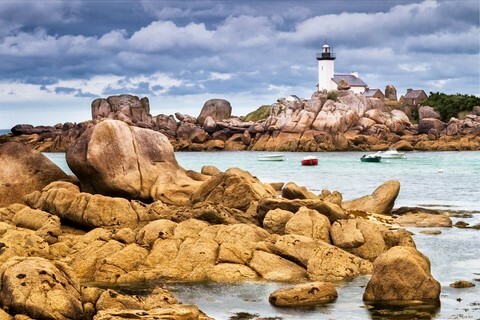 One of the most striking features of this section of Brittany coast, however, is the multitude of tiny islands and rocky promontories which make this coast so difficult to navigate, making it a place of numerous shipwrecks and legends. After passing Pointe Carsen you'll reach Le Conquet with its historic buildings and lively harbour. You can choose to finish your walking holiday at this point or continue along a more difficult cliff-lined section of coast towards the historic port of Brest. 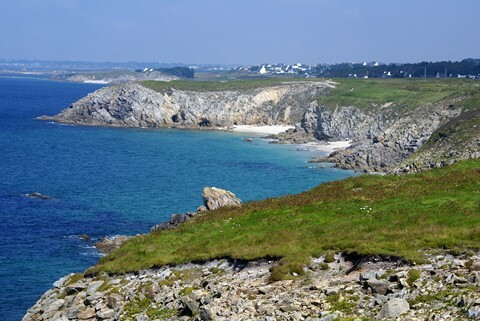 Walks on this self guided holiday in Brittany are on an undulating coastline alternating between easy and moderate walking, with distances varying between 14 & 22km per day. The average amount of ascent and descent in the day is 200m and the maximum is 350m on the 6 day walk and 650m on the 8 day walk. Some days feel harder as they constantly rise and descend, and so it is harder to find a rhythm. The paths are well maintained and for the most part are well sign posted as you are following the long distance GR34 coastal trail. Arrive in Brest and transfer to Aber Wrac'h. Possibility of transfer from Roscoff (supplement). 7 night, 6 day walking holiday ends in Le Conquet. 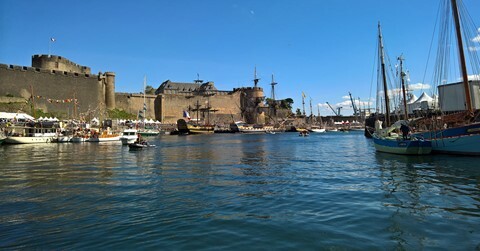 After a transfer back to where you finished the day before, continue to head East, passing more historic forts protecting the coast and lighthouses showing the channel that the boats need to take to reach Brest, which is the 2nd largest military port in France. This is a much more difficult section of coast with the coastal path undulating between small headlands and narrow inlets. 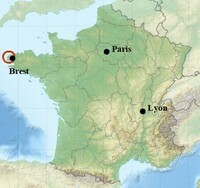 Transfer from near the entrance to Brest to your hotel in the centre. 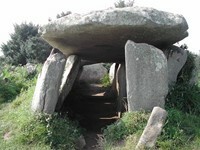 Mainly charming and friendly 3 star hotels on this Brittany walking holiday in France. Very comfortable accommodation. We leave you the choice of restaurants and/or menus on many nights so that you can manage your budget. Good hospitality and comfortable accommodation throughout your stay with ensuite rooms. Tasty regional cuisine. Below you'll find examples of the different types of accommodation we use. On the edge of the Aber Benoit estuary you’ll find the Kerasquer B&B, located in a renovated farm, mixing historic and modern architecture. The B&B is located in a quiet location a couple of kilometres from Lannilis. Kerasquer contains 4 spacious and comfortable rooms, as well as an enclosed garden and sunny patio to relax after your walk. Located in the historic centre of Le Conquet, you’ll find the 3 star Hotel Le Vinotiere. Only 50m away from the ancient fishing port it offers a warm and relaxing atmosphere. La Vinotiere hotel is a 16th century house which was entirely renovated in 2007 and has ten individually decorated rooms each a tasteful mix of ancient stone, wood and contemporary materials. The reception area is part of a large lounge with a fireplace and a magnificent original stone staircase leading to the upper floors. 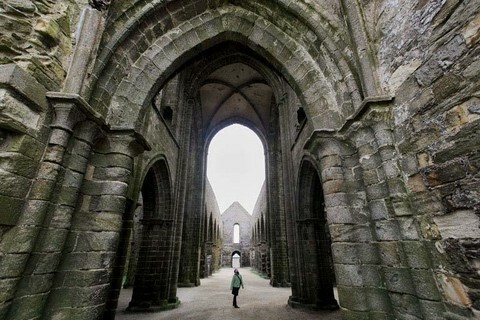 Make your own way to Brest. Transfer included from Brest to first guest house in Aber Wrac'h. Transfers also possible from Roscoff for a supplement. Brittany Ferries run boats from Plymouth to Roscoff in Brittany. Drive to Aber Wrac'h. Please contact us about possibilities for parking your car for the week. Eurostar and the TGV run trains from London to Paris where you need to change and catch a train direct to Brest. Bus to Brest if finishing at Le Conquet. From Brest train services or flights as above.